Fantasy did in fact exist before the advent of the watered down Tolkien pastiche. To someone that didn’t grow up with older books, they’re almost impossible to imagine. So it was for me when I first heard that Michael Moorcock was, in effect, the Anti-Tolkien¹. I mean… how could such a thing even be when for all intents and purposes, Tolkien fairly well defines modern fantasy…?! Well, if you want to know… if you have to know what it was that publishing and the libraries and the movies have mostly turned their backs on, then read this book. It’s not even a hundred and eighty pages long and it is a very fast read. It’s not some sort of monstrous series where every book segues into the next, where each book ends on a cliffhanger, and where about four novels in everything suddenly takes on that soul-numbing “contractually obligated” feel. No, this book is a good reading value. When you finish, you’ll still want another eighteen hundred pages in this vein! But what is the “Anti-Tolkien” like in a nutshell? Well… take everything that’s awesome about every heavy metal band in the history of rock and roll and boil it down until have an elixir of pure metal. Now transmute that into short novel form. That’s as concise a way as I can put it. There are no themes of mercy for those that don’t deserve it. There are no scenes depicting undying loyalty from servant to master as the weak things of the world head off into the heart of darkness to confound the things which are mighty. There is no unlikely deus ex machina for the free peoples of the world to stoically put their faith in as they fight their long defeat. No, what you have here in this book is more along some sort of literary antecedent to the ethos of Black Sabbath’s “Paranoid”. It was a slithering sound, a slobbering sound; the sound of a baragoon– the marsh gibberer. Few of the monsters were left now. They had been the creations of the former Guardian, who had used them to terrorize the people of the Kamarg before Count Brass came. Count Brass and his men had all but destroyed the race, but those which remained had learned to hunt by night and avoid large numbers of men at all costs. That thing won’t turn to stone if a friendly wizard can only stall it until sunrise. Tom Bombadill is not right around the corner ready to bail the protagonist out the moment he sings a silly song. This thing isn’t hoping to prick you with some kind of magic blade that will slowly overcome you if you can’t make it to the happy refuge of the sparkly elf creatures. No, it just wants to eat you. And there’s stranger and deadlier things out in the wilds as well. The world of Moorcock’s Hawkmoon series is not a happy place. Instead of a mythical past where a group of Anglo-Saxon warriors ride to the rescue in just the nick of time, Moorcock gives us a future where anything remotely British is synonymous with greed, torture, conquest, and insanity. The people of that freakish nation all wear horrific animal-faced masks, a different one according to their caste. Their armies march over a silver bridge into Europe and completely devastate everyone that stands in their way. Country after country falls to them and they crucify their enemies’ girl children, castrate their boys, and force the adults to utterly humiliate themselves in the streets if they want to live. “Amarehk” isn’t coming to bail people out this time like in all those other world wars. No, Amarehk avoided the worst consequences of the Tragic Millenium; its godlike rulers are thoroughly isolationist. But Granbretan will come for them soon enough. It’s all too happy to destroy its enemies piecemeal and the world is idly standing by and watching them do it. This lead into a small, blindingly lighted chamber of white metal that contained a machine of intense beauty. It consisted almost entirely of delicate red, gold, and silver webs, strands of which brushed Hawkmoon’s face and had the warmth and vitality of human skin. Faint music came from the webs, which moved as if in a breeze. “It seems alive,” said Hawkmoon. Count Brass raised his sword in a signal, and there was a great flapping and snapping sound. Looking behind him, Hawkmoon saw the scarlet flamingoes sweeping upward, their graceful flight exceedingly beautiful in comparison with the clumsy motions of the metal ornithopters that parodied them. Soaring into the sky, the scarlet flamingoes, with their riders in their high saddles, each man armed with a flame lance, wheeled toward the brazen ornithopters. There’s some grit and grime mixed in with Moorcock’s fight sequences as well. They’re are not like those in many of the other Appendix N titles. Weapons break. Shields splinter. People get stunned and fall unconscious. Raw strength is a huge factor, but psychology probably matters even more. And people just plain get tired, too. In the end, a lot of fights come down to who has the ability to just get up and deal one last blow when both combatants are already completely exhausted. And strategy, tactics, and morale all come into play as well. The battles presented here read like they were drawn from real world actions by guys like Stonewall Jackson or Nathan Bedford Forrest. The combat that results is a consequence not just of the technology and magic, but also of the character and attitude of the leaders involved. Moorcock does not take a lot of time to pontificate on these matters, but it’s clear he’s given thought to this and conveys his vision with one piece of all out action after another. J. R. R. Tolkien created sort of an English analog to The Kalevala– in a sense, he created a national myth for Great Britain. And to the extent that Tolkien creates a positive picture English and Western people standing against dark forces from out of the east and the south, Moorcock does the exact opposite: His Granbretan is the source of ultimate evil. As shocking as that contrast is, perhaps more surprising is the fact that the antithesis of Tolkien style “high fantasy” is not Robert E. Howard’s approach to “swords and sorcery.” No, the thing that is antithetical to “high fantasy” is the often brutally dystopian “science fantasy” genre. That sort of wild far future fantasy has all but disappeared today. Concurrently, a lot of people that have been frustrated over the years in their attempts to get the Dungeons & Dragons game to better emulate “high fantasy” tropes they’ve come to associate with the fantasy genre. When this doesn’t work the way that they want, they usually impose “rail road” style adventures upon it or else just throw up their hands and declare that the system is “broken”. Oh sure, there are elves and hobbits and orcs that look like they were pulled straight out of Tolkien’s oeuvre. But the implied setting of D&D and the sort of adventures that people tend to have in it are nothing much like his stories. This leads to no small amount of friction and cognitive dissonance. The science fantasy elements of the game were far more pronounced in the early days, of course. A very significant chunk of the books that inspired the game were of the genre and many people that played the game early on had no problem thinking in terms of it.² When the big publishers pushed to crystallize fantasy series around generic high fantasy themes, D&D largely followed suit in order to keep up with the times. And just like Gygax would push to have the monk class removed from AD&D once Oriental Adventures was on the market, so too would AD&D have its science fantasy elements gradually bled out of it once Gamma World could become the repository for everything in that vein. They could hire Larry Elmore to paint a new set covers and they could fine tune the rules in order to adapt to new audiences. But even after taking all those changes and accommodations into account, there’s a certain attitude that remains in the mix. 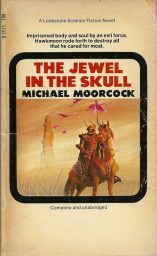 Consequently, I would argue that you’re probably going to get more gaming inspiration reading Michael Moorcock than you would reading Tolkien. He can give you a far better understanding of the sort of world that is implied by the rules. Because yes, it’s not just Moorcock’s work that sprang from an “Anti-Tolkien” approach to fantasy. D&D did, too. ¹ See Peter Berbegal’s The Anti-Tolkien from The New Yorker back in December of 2014. ² Again, see D&D’s Appendix N Roots Are Science Fantasy at Roles, Rules, and Rolls for more on that. However, it seems odd to imply the sort of thing doesn’t exist these days. Haven’t Games Workshop been mining (or stealing) from Moorcock for the last 25 years or so? Their entire Warhammer cosmology is massively influenced by Moorcock – and in particular, 40K is by the the Runestaff series – in both style and substance. Warhammer just doesn’t register to me as being science fantasy in the same way as Dying Earth, Hawkmoon, and The Warrior at World’s End. When I try to even explain what science fantasy is to people they usually have NO IDEA. Certainly the idea that D&D’s inspirations are largely science fantasy is news, even to people that have been playing for ages. There is a generation gap here. People that are just two or three years older than me have a far greater chance of being aware of this stuff. I’m not saying there are no counterexamples. But there has been a shift. Thanks for the tip about GW. I wasn’t aware of that Appendix N connection. Yeah, the old stuff has a lot more of a genre mix. I know you’re making a point here, but I think you’re being unfair to Tolkien. But I suppose you knew that and were trying for rhetorical effect. Tolkien is quite rightly called the author of the century. I reread The Lord of the Rings every few years by accident and I’ve read it out loud to my kids. However… only superficial elements of his work were used in the creation of D&D. Fritz Leiber’s Fafhrd and the Gray Mouser are, for instance, are far more in tune with the spirit of the game. Science fantasy in general provides a better source for understanding the utterly bizarre implied campaign of the earliest editions of the system. I don’t think I make any attacks or digs at Tolkien here beyond echoing a few common complaints. I’ve read On Fairy Stories. I know what some of this means and why it really is as powerful as it is. My main problem is that a bastardized version of his work forms the baseline for what we think of as fantasy. I merely suggest taking the opposite tack can result in some great gaming. And I know this is hard to even imagine for some, because it was for me before I read all of these books. Even people that try to evoke Tolkien do not sit down at the table, show mercy towards a creature that does not deserve it, and then wait for God to use him as the instrument of deliverance– to help the heroes do what even they are incapable of doing on their own. In contrast, Moorcock’s situations and setting as depicted here are just going to be a far more likely fit with how most people end up playing. You’re right that people tend to emulate exactly the wrong things about Tolkien. What made LotR so great was not the hero’s journey, per Campbell, but the many ways it DIFFERED from the traditional Hero’s Journey. – The main hero is not “The Chosen One”. The closest character to a chosen one is Aragorn; his biggest role, in the end, is to form the world’s biggest distraction. – The hero does not complete the quest but fails, fails completely and utterly, and fails immediately before journey’s end no less. Frodo does not end the journey heroically; he does not defeat a great villain, overcome temptation, or sacrifice himself. He succumbs to the power of the Ring entirely, and the Quest is only saved because of his earlier mercy towards Gollum. Frodo does not end up journeying alone; in fact, at no point in the journey, save his brief kidnapping by the orcs, is Frodo alone. He always, always, always, has a helper, and even the final moment, which should be all Frodo, is actually between Frodo and Gollum. People will often accuse famous stories of being formulaic when they’re most notable for breaking the formula. See Exhibit B: “The Maltese Falcon”, which is often used as an example of a book driven by a macguffin when the whole point of the book – what makes it truly brilliant – is that the macguffin is entirely worthless and anybody who thought that was the point was being misled! All growing up I’ve heard this or that about what level Gandalf would be, how powerful the Fellowship party is, so on and so forth ultimately concluding that Middle Earth and the Lord of the Rings don’t really convert to D&D very well. Which makes sense if one assumes that D&D was never meant to be a system for modelling Tolkienian fantasy. Whereas you could run the first Lankhmar story as a 1st level module merely by noting a stat-block in the margin. More interesting is figuring out better reasons for LotR to be in Appendix N beyond Gary just not wanting nerds to yell at him for leaving it off. The thing I like best about Merry & Pippin is that they tend to act as though they’re in a heroic fantasy. All other halfling characters I’ve encountered in fantasy fiction are some Flanderized derivative of Pippin. What Tolkien gave us above all else in D&D was the party-based DUNGEON adventure. Two different sequences in the Hobbit (Bilbo in the orc stronghold and under the lonely mountain) and secondly the fellowship in moria. Hobbit and LOTR each feature the formation of multi-classed and multi-raced parties composed sizable groups (9-13) adventures with a mix of fighters of various races, a thief and a magic user, who engage in underground adventures and fight nonhuman monsters in said adventure. It is this element – (plus the superficials of ents, hobbits, dwarves, elves, orcs) that is the big inspiration from Tolkien. In contrast, most classic sword-and-sorcery features 1-2 highly competent heroes who are fighters , fighter-mages (Elric), thief-mage (many Dying Earth characters), or fighter-thieves (early Conan, Grey Mouser). D&D in contrast borrows the tropes of LOTR-style epic fantasy in which the primary heroes are relatively weak (like starting hobbits, say), mostly sngle-classed, gather magic items, and level up. In that vein it’s worth looking at the Giants in the Earth columns in Dragon to note how much TROUBLE D&D rules often have in statting out the sword-and-sorcery heroes they supposedly emulate – attempts to do this often required them to break the rules and allow much more multi-classing than is normal! A secondary but very important borrowing from Tolkien: remember, D&D grew out CHAINMAIL. CHAINMAIL was a set of wargame rules. There are battles in Conan, Moorcock, etc. but the ones in Lord of the Rings were among the more vividly described and also, oddly enough, those in which personality-figures (heroes,etc.) tended to make a difference. We see in the 1970s that Tolkien-inspired figures and war games were just as if not more popular than Howard-inspired figures (though these were big as well, re. Tony Bath, etc.) D&D drew heavily from Tolkien for military elements because Tolkien had good military campaigns in LOTR (and unlike Howard, battles in which fantasy races and monsters were involved on both sides. (Moorcock had mass fantasy battles with various critters but they tended to be ungamable due to excessive power levels/divine intervention). This inspired CHAINMAIL and fantasy wargaming fandom, and CHAINMAIL led directly to D&D. (Of course, there are other influences. GOR – the fantasy world that is massively politically incorrect – seems to have been a big influence on Arneson, if not on Gygax. Arneson’s version of Appendix N remains largely unexplored. Great comment. It’d take an entire post to give it a proper response. I probably would have to reread the books for the nth time, play some Chainmail, and think deep thoughts first as well. Thank you! ::slowclap:: This comment is getting bookmarked. The bit about “wait for God to use him as the instrument of deliverance” is the crucial part. Tolkien wrote a story where the individuals were players in a larger myth that transcended any of them. The story was bigger than the characters in it, even if the characters themselves were memorable. D&D would be a failure if it did that – the characters need to be the big shots, else why would anyone play? We read (or watch) a story to be entertained by the story. We play a game in order to have an impact. Some players I know would agree with you. Though oddly enough, many players I know instead PLAY in a game to be entertained in the story and have no interest at all in becoming big shots! A good thing too, as in old school games the average PC starting out had the lifespan of a mayfly and about as much impact on the world. Indeed, I’m told that back in the 80s that was the main appeal of TRAVELLER and then CHAMPIONS – games that finally let the players start out as big shots, rather than have to play for a year or six to have any chance of gettng there…. I think TRAVELLER was so freakin’ big that it was easy for a player to be a local bigshot without needing to be a… I guess universal… big shot. But I think there’s still the distinction of whether the story is something the players are contributing to (by their choices) or whether it’s a railroad carrying them to a pre-ordained destination. I’m going to have to work up an article regarding the Warhammer 40K and Warhammer Fantasy IPs – they don’t get enough credit for their lore, and world building, even though the work of some authors, like Dan Abnett, is pretty fantastic! I don’t know if it’s because it’s a licensed set of properties, or just the gaming connection. But I think the best authors in the “Black Library” understand the majesty and tragedy of world history, and can incorporate that very well into the science fantasy milieu. And 40K especially is science-fantasy, WFB has some elements, but 40K, for all its “grim dark” baggage, is a mine worth digging. Please drop me a note when you do that and I will link to it on Google+ and on my blog. I would love to know more about that, but it’s so far outside of my scene I wouldn’t know where to start. I’m sure a lot of people here knew it already, but on the subject of LOTR being so unlike the D&D style, you might want to check out the webcomic “DM Of The Rings”, which is basically about this exact matter. It’s about what if LotR was a RPG campaign rather than a classic novel, and it’s pretty hilarious. Oh, that thing is seriously funny.